Three years ago, Huw Parry was on the verge of chucking it all in. Although his South Wales sheep farm avoided the devastating foot-and-mouth outbreak of 2001, years of miserably low meat prices left him out of pocket on every carcass he sold. None of his family wanted to carry on the business: "I would have sold up, if I could have found anyone to take the place on," he says. Luckily he didn't. Now, lamb prices are surging, the business is in profit for the first time in years, and Mr Parry's grandsons have decided to make their future in sheep farming. "Optimism doesn't come naturally to us sheep farmers," Mr Parry admits. "But things just might be starting to look cheery." Over at the National Sheep Event in Malvern, meanwhile, the only bleating is coming from the flocks. The industry's biennial get-together is a lively affair, with thousands of farmers pricing up Zintec Ewe-Flusher or Osmonds Pre-Tupping Drench, comparing the charms of the Blue-Faced Leicester and the Rouge de l'Ouest. "A lot of serious business gets done here," says Peter Baber, a Devon farmer and chairman of the National Sheep Association, the organisation behind the Malvern event. "All the industry's movers and shakers are here." 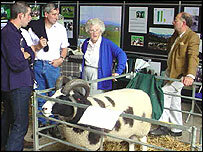 A lot more moving and shaking, certainly, than at the last National Sheep Event in 2002. Then, the industry was coming to terms with foot and mouth, which necessitated the slaughter of at least 3.4 million sheep. Compensation was paid, generously and reasonably promptly, but to many farmers at the time, it seemed like the death of the sector. "It was a miserable time," shudders one Welsh sheep farmer. No-one at Malvern will quite admit it, but the mass killings of 2001 could be underpinning their current prosperity. The cull has wiped out the oversupply that weighed on the lamb market during the 1980s and 1990s, and stocks remain low. As a result, lamb prices have jumped by one-quarter in the past couple of years, and are now almost three times higher than their late-1980s trough. Profitability has increased too. 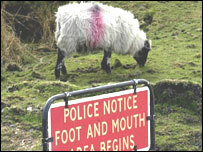 In theory, sheep farming as a whole remains in the red. 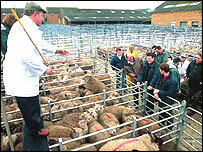 According to the latest calculations, the average sheep is sold at a net loss of about £9. But, says Jane Connor, an economist with the Meat and Livestock Council, most farmers are not conscious of those losses, because they do not accurately reckon their fixed costs. And higher-quality sheep are selling well - the top third are earning about £20 in net profit per head. More significantly, perhaps, migration out of farming is at a remarkable low. According to Martin Waite of the Agricultural Mortgage Corporation, a property consultancy, sales of farmland are at just one-tenth of their normal level, and the price of farmland has roughly trebled since the late 1990s. Many analysts think so. One cause for cheer is what many see as huge growth potential in lamb consumption. Richard Sadler, head of meat buying at supermarket chain Waitrose, says there has been "a terrific recovery in red meat sales" since the various food scares of the past couple of years. And farmers, he says, are getting better at providing the cuts and the quality that an increasingly fussy consumer demands. Ten years ago, only 60% of lamb submitted to Waitrose met its quality standards; now, that figure is 85%. There is plenty of unmet demand, too, says Kevin Pearce, chief livestock policy adviser at the National Farmers' Union (NFU). He points out that even the lamb-loving British eat less than 7kg per head a year, less than half the average in Australia and New Zealand. In Continental Europe, consumption is at most 2kg per head. "There's a huge untapped market on our doorstep," he says. The other main cause for cheer is, ironically, something that is sparking panic among most British farmers - the imminent change in European Union farm subsidies. From the beginning of 2005, subsidies are switching over from production-linked payments to a single hand-out per farm, based on various measures of stewardship of the land. Anyone involved in intensive farming is likely to lose out. Dairy farmers, used to a fairly generous per-head payout, are already forecasting disaster. But the hardy sheep farmer has generally got by on leaner largesse. The average British sheep brings in about £13 in subsidies a year, compared with £160 for a cow. Since sheep farming is never intensive - indeed, from most points of view, it is highly eco-friendly - few sheep farmers are likely to be out of pocket under the new regime. Some, especially those in poorer hill areas, are likely to benefit - and farmers will be able to keep the same level of subsidies while reducing their overall number of sheep. There are concerns that sheep farming become a victim of its own success. Dairy farmers, it is feared, may start shifting over to sheep in big numbers, threatening the sort of oversupply that doomed the industry a decade ago. But the NFU's Kevin Pearce sees no sign of an influx, in any case, sheep farming is seen as such a skilled business that opportunistic entrants will have little chance to compete. More threatening, perhaps, is competition from Down Under. New Zealand producers still command about 30% of the UK lamb market, and have consistently outmanoeuvred their British rivals. Mr Baber says that New Zealand sheep farmers are generally up to 50% more productive than the British. An average New Zealand farm may have 2,500-3,000 sheep per worker, compared with at most 1,000 in the UK. Last year, when lamb prices rocketed, British farmers were unable to raise production, and the New Zealanders cleaned up. But New Zealand lamb exports have nearly doubled in the past decade, and many reckon they are due for a reverse. Hugh van Cutsem, one of Britain's biggest sheep farmers, believes that high fuel costs will inevitably start to freeze New Zealand out of European food markets. In Malvern, they are determined not to be caught napping once again. As one delegate growls: "This time, we're ready for them."